As a young boy living on the west side of Atlanta, GA, Marcus Sabir set the goal of becoming a successful business man. This goal was the launching point of a lifelong journey. The boy with big dreams earned the title of “Big Daddy” by the owner of a store where he worked. At 13, he worked as a stock boy at the neighborhood store. The young “Big Daddy” observed and cherished the working class who established their own businesses while making a difference in the community. Working toward fulfilling his dream and goal, he worked hard, paid attention, asked questions, and studied the intricacies of business ownership. Now a self-made businessman, Big Daddy has proven that hard work is a means for achieving one’s dreams and goals. As an adult, he worked as a meat cutter and later as market manager for Hardy’s Supermarket in Atlanta’s West End neighborhood. While still working at Hardy’s, he opened and was co-owner of “Make it Snappy’s”, a fast food kiosk in the parking lot of the supermarket. "Big Daddy’s" tiny restaurant served barbecued meats and fried fish and was popular in the neighborhood. The business eventually closed, but "Big Daddy" did not give up the dream of owning and operating his own successful business. After 12 years of working at Hardy’s, the native of Atlanta, husband and father was ready to step out on faith and try his hand at business ownership. He had cultivated a love of cooking and was confident in the business knowledge he had developed over the years. He opened Big Daddy’s Meat Market in the West End and was successful for 4 years before branching out to open, own and operate his own wholesome soul food restaurant, called Big Daddy’s Café. His specialty was providing a clean environment that celebrated the African-American heritage with art, good music, good people and promotion of healthy, delicious choices in eating to patrons of all ages and nationalities. Considered a favorite place to dine, people come from miles away to get some of Big Daddy’s meals where the vegetables are home cooked and the meats are savored and prepared with Big Daddy’s special recipes. The first home of the Big Daddy’s restaurant was Cascade Road, a quaint facility that held less than 40 patrons, but greater things were in store! He later moved and expanded to include the three current locations: the Breakfast Nook (Riverdale Road); the restaurant, Big Daddy’s Café (Riverdale Road); and Big Daddy’s Deli (Old National Highway). 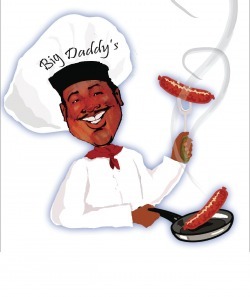 Now "Big Daddy" proudly presents his new line of food items to you! Years of hard work, experience and love have been poured into the development of these products. He knows you will enjoy their down home taste and will come back for more.